St. Nicolas, Nuneaton is immortalised in fiction. In George Eliot’s first book Scenes of Clerical Life (published 1857) it is depicted as ‘Milby’ Church and plays a major role in the third of the Scenes, Janet’s Repentance. The story centres around the stormy and violent relationship of the prominent Milby lawyer Robert Dempster and his wife Nancy and depicts an actual event in the religious history of the town. In 1828 the evangelical curate of Stockingford chapel, the Reverend John Edmund Jones, was invited to give a series of Sunday evening lectures in St. Nicolas, an event that caused great controversy. The lawyer James Buchanan –the Dempster of George Eliot’s fiction – led the strong opposition to the lectures being permitted. James’ wife Nancy was born Nancy Wallington and her Mother, also Nancy, ran the school at the Elms, where George Eliot attended and where she was first influenced by Evangelicalism. The Elms, near the church, did not survive the Second World War bombing in 1941. 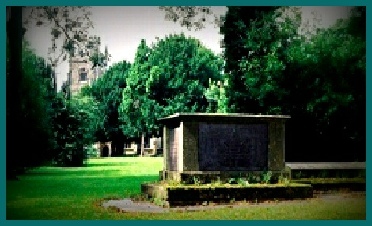 The Buchanan family tomb can be seen in St. Nicolas churchyard at the far end from the Church, near King Edward Road. Eliot depicts in fiction many of the other Nuneaton figures she would have remembered as a girl at school in the town – people such as the St Nicolas curate, Hugh Hughes, who served the parish for 50 years and is ‘old Mr. Crewe’ in the story. Hughes is at the end of his career and struggling to cope. The vicar of the parish is non-resident and Nuneaton a parish spiritually neglected, hence the invitation to Jones. Eliot describes the bad behaviour of the young people in the large church galleries during the services. In Scenes, other events in the life of the Church, such as the Bishop arriving for a confirmation service are portrayed in affectionate detail. George Eliot’s clergyman, Reverend Edgar Tryan is based on the real clergyman, Jones. Tryan – a sympathetically drawn portrait – gives valuable support to Janet after she is ill-treated by her husband and this is a moving part of Janet’s Repentance. However, the wonderful descriptions of the townsmen and women of Milby is arguably the best written piece of the story, giving us a shrewd insight into the parishioners of the time.